»Bangalore To Yelagiri Hills – An Express Expedition! Bangalore To Yelagiri Hills – An Express Expedition! Yelagiri is a small hill station, spread across 29 sq km of area, in Vellore district of Tamil Nadu. It is located just about 160 km from Bangalore, and is therefore, a fantastic getaway for the weekends! The drive to Yelagiri Hills has 14 exciting hairpin bends towards the final part, which then unfurls to a magnificent mountainous terrain. It is an upcoming hill station, famous amongst the trekkers of India. Tourist department has now introduced more adventure activities such as rock climbing and paragliding as well! The rustic village of Yelagiri is surrounded by scenic views of rose gardens, orchards and green valleys. June to February is an ideal time to visit Yelagiri. If you are an adventure-bug, then The Yelagiri Paragliding Club, hosts an international paragliding festival around the month of September, which you must take part in. We recommend the first Route since it is the fastest. Here are the places to visit on the way to Yelagiri from Bangalore. The bumbling town of Hosur, located 40 km from Bangalore, has a relatively pleasant climate throughout the year. This makes the town perfect for growing roses; the same roses that are transported to the city in abundance around Valentine's Day! Hosur happens to be the largest exporter of roses in the country. Pratyangira Temple located in Hosur, has the biggest Pratyangira Devi statue on the rajagopuram (monumental tower on the temple). Chandra Choodeswarar Temple, also known as Malai Kovil, is an ancient temple dedicated to Lord Shiva, situated on a hill. The pinnacle offers a breathtaking view of the entire town of Hosur. About 12 km off-route from Hosur, lies the Rajaji Memorial. Situated at Thorapalli, it is a small tiled house which belonged to Chakravarthi Rajagopalachari, fondly remembered as Rajaji. The government took over the place to turn it into a memorial, therefore, his belongings and photographs are exhibited for the tourists and visitors. 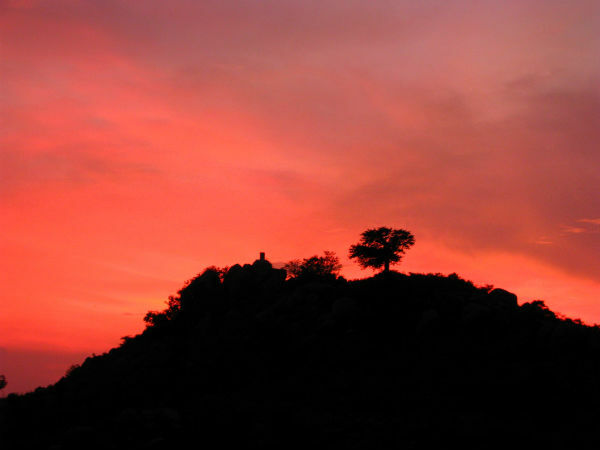 Shoolagiri is a small town, in Krishnagiri district of Tamil Nadu, located about 25 km from Hosur. The town is dominated by a hill crowned with three peaks (Trident or "Shoola"), which is the origin of its name. A huge forest area situated close to Shoolagiri, houses a very interesting bird. It is the hoopoe, (orange feathers-crowned woodpecker), which is usually found across Afro-Eurasia. Tortoises are also found under the lake-side bushes. Varadaraja Perumal Temple, situated on the foothills of the Shoolagiri is a temple dedicated to Lord Vishnu. On May 21st of every year, Varadaraja Perumal Jayanti is celebrated in this temple. Chinnar Dam, built on the River Ponniyar is just 6 km from the temple. The hill's vista along with the surrounding thick forests forms a serene landscape. Krishnagiri is a district of Tamil Nadu, located on the way to Yelagiri Hills, around 30 km from Shoolagiri and 94 km from Bangalore. Places to visit here are the Krishnagiri Fort, Krishnagiri Dam, and Shree Parshwa Padmavathi Shaktipeet Tirth Dham, also known as Krishnagiri Shaktipeetam. The Krishnagiri Fort built by King Krishnadevaraya of Vijayanagar Empire is one of the strongest forts, now a monument protected by the Archaeological Survey of India. Krishnagiri Shaktipeetam is a spiritual organization, that was built in order to promote peace and harmony. Read further to know about the things to do and places to visit in Yelagiri. At the highest peak of the Yelagiri Hills, with an altitude of 4,338 ft, stands the Swami Malai Hills. Of all the treks available in Yelagiri, trekking on these hills is favoured usually by trekkers. The top of the hill, which houses a small Shiva Temple, gives a picturesque view of Yelagiri. The entire trek takes up to 2 - 2.5 hours. Don't forget to carry your a water bottle, and snacks , as there are no shops available nearby. Many clubs offer paragliding of various height preferences. Usually, they offer three take-off and landing points at the heights of 450 m, 560 m and 600 m above the ground level. Also, by hosting international paragliding festivals, clubs here are making an effort to make Yelagiri, a top-class paragliding spot. Punganur Lake is a popular artificial lake in Tamil Nadu, that stretches for 60 sq m and is 25 ft deep. The lake has boating and rowing facilities and an adjoining park called the "Mughal Garden", which makes for a perfect spot for relaxing. Located 37 km from Yelagiri, Jalgamparai Falls originates from the River Attaru. A wash under the falls is believed to cure diseases as the water crosses many herbal plants before cascading into a stream here. A trek of almost 6 km from Nilvoor, that takes about 1.5 hours, takes you to the top which offers an awe-inspiring view of the entire valley. Local guides are available to help complete the trek. Best time to visit Jalagampari Falls is during October to February, when it is filled with water from the monsoon rains. The Tamil Nadu Government conducts Summer Festivals every year during the months of May and June. This festival has folk dances and various other cultural programmes, focussed on showcasing their native culture and traditions. As a part of the festivities, sports like Volleyball, Kabaddi, boat races and more are organized by the sports department.